This is a guest article from Aaron Celovsky. 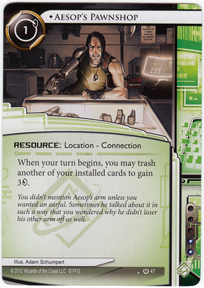 Netrunner is a game defined by what one does with a limited set of actions, so it should come as no surprise that successful runner decks all have efficient engines for converting resources. Specifically I’ll be focusing on three strong runner decks that have implemented strategies around key economic engines: Andysucker, PrePaid Kate, and WyldShop Noise. Simply put an engine is a machine that converts one type of resource into another. In a car it converts fuel into forward movement. In a person it turns coffee into writing Netrunner articles and trips to the restroom. 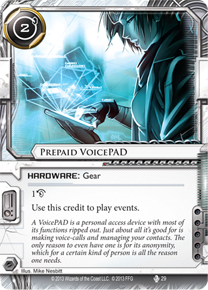 In Netrunner a good engine converts clicks into credits, cards, and occasionally runs. In other words an engine is what powers the deck’s ability to function. Engines don’t get accesses, break ice, or steal agendas, but engines are the combination of cards that enables these things to happen economically. Often times a functioning engine is the difference between a functioning efficient deck and a random stack of cards. 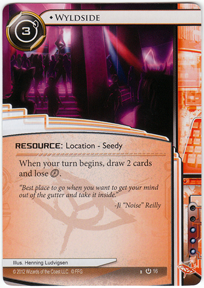 In Netrunner there is a base inefficient engine that all runners have access to. It’s the 1 click for 1 credit, 1 draw, or 1 run ability, but in this article I’ll be talking about engines that are more efficient than these base abilities. The other aspect of an engine is its permanence. Simply including credit-gaining or card-drawing cards in one’s decks improves (briefly) the efficiency of this base engine. The engines I’ll be talking about create a new permanent base efficiency. Think of cards like Sure Gamble as fuel. Put into the Yugo that is the base ability and it gets one so far, but that same fuel put into the Porsche 911 of a Pre-Paid Kate deck gets one a lot further. One of the first runner engines, this came together slowly over a fairly long period of time. It started with simply Desperado and Datasucker and eventually finished with John Masanori, and Security Testing. The strength of this engine was its ability to pressure the corp while setting up and how the discrete components could come together in any order. Desperado is a great card. On it’s own it gives a credit per successful run, which is great for simultaneously threatening corp servers and developing the runner’s board state. 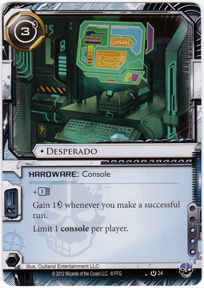 But against an undefended server running with Desperado yields the same credit gain as clicking for a credit. However if one adds a Datasucker now that same run against an undefended central yields a credit, an access, and a virus counter. That virus counter could be worth a credit itself if one is running a straightforward breaker like Corroder, or more in the case of Ninja (3c) or Mimic/Yog (very high value). Now add another piece like John Masanori and that same run is yielding a credit, a virus counter, and a card. Then Security Testing added two more credits to the mix, so the final total was 3c, a virus counter, and a card! And that’s before you add fuel like Dirty Laundry (+3 credits) or Bank Job (+7 credits!). This engine turned the run action into a constant stream of credits, cards, and virus counters which was quick to set up and hard to shut down. The strength of this engine was that it worked while pressuring the corp, meaning that early game the corp could either go broke trying rez ice protecting all their remotes or let the runner develop (and in some cases also get accesses). In addition it’s components were cheap, and the order of install didn’t matter much, any two of them made for a more efficient engine than the base abilities. The drawbacks were minor and could easily be played around – Datasucker only works on centrals, John Masanori only works once a turn, Security Testing doesn’t work with Bank Job and can’t be stacked, etc. Because of these strengths Andromeda was a natural choice for this engine. Often the only draw of the engine was John Masanori so Andromeda’s opening hand supported this, to help ensure seeing at least two engine pieces early on. This engine made Kate probably the runner deck to beat for two years in a row. The engine was very simple, essentially just Pre-Paid Voice Pad and a few optional add-ons like Astrolabe, Symmetrical Visage, or Professional Contacts, and was mostly served by strong fuel cards like Lucky Find and Levy AR Lab Access. These enabled Kate to not only strike from a low credit threshold, but repeatedly make strong, high-value runs. The engine may not have looked like much at first, simply three copies of Pre-Paid Voice Pad (PPVP), but the effect was to turn all a set of regular fuel cards into high-octane blasts. Normally a runner playing Sure Gamble nets a gain of four credits but each PPVP reduced the up-front cost of Sure Gamble, which not only lowered the threshold from which it could be played, but effectively gained Kate a credit. At full power, with three PPVPs in play, Sure Gamble now gave 7 credits, Lucky Find gave 9 credits for two clicks, Dirty Laundry gave 5 credits and a run, Quality Time gave 5 cards, and so on. This was occasionally coupled with smaller engine pieces that increased Kate’s draw power. Astrolabe would give draws for free, which essentially gave free clicks to Kate. Symmetrical Visage or Professional Contacts both gave credits for drawing, which Kate needed to do anyways to find her fuel. Then once all the fuel had been spent, a cheap Levy AR Lab Access, costing only two credits, would recycle it all back into a much thinner deck. This money wasn’t unlimited like the Desperado/Sucker/Security Testing engines was, so Kate ran high-value run events that also could use the credits off PPVP. Thus rather than running often, like Andromeda, Kate ran effectively instead. Why Kate? Her ability to reduce the install cost of hardware, meant that the PPVP’s came into play for only 1 credit and thus paid they for themselves the first time they discounted an event. In addition her ability to reduce install costs of other programs and hardware meant she was better able to leverage the ultimately limited funds from economic events. The deck was an efficient and effective beast from it’s inception until it was hit hard by the NAPD Most Wanted List, which severely curtailed its influence. The base components for this engine are actually from the core set itself and saw some play, but it wasn’t until effective fuel came out in the form of Cache that the deck really took off. Probably the most complicated of the three engines it uses Wyldeside to draw many cheap cards, installs them and then trashes them with Aesop’s Pawnshop to be able to install more cards next turn. The engine consists of Wyldside (often supported with Adjusted Chronotype), Aesop’s Pawnshop, many cheap virus programs, and occasionally install supports like Cyberfeeder and Scheherazade. The order of pieces is somewhat important here. Noise wants to see Wyldside early on to see a constant stream of cheap viruses, then he sells them off for more than their install cost, so he can install more next turn. There are very few runner cards that give a permanent draw bonus, so Wyldside does so at the large cost of losing a click. It can be best to think of this as being given the ability to click for two cards, but being forced to use it once per turn (and only once per turn). Thus it’s imperative that the cards being drawn are cheap so that they can be easily installed to free up space in the grip for more cards next turn. Next Aesop’s Pawnshop trashes the virus to not only give money for installing, but also frees up mu space for further installs. Here is where fuel cards like Cache come in. Cache is not only cheap to install but also gives money back without trashing itself so it can be trashed with Aesop’s Pawnshop later (which is why the earlier, similar Gorman Drip never helped this engine). The Wyldside is generally more important to see first because it not only increases the chances of seeing the Aesop’s Pawnshop through draw power, but also it’s easy to just overwrite superfluous programs if need be. This engine works especially well out of Noise because each of these cheap virus installs mills the corp turning on archives as a vulnerable server. Like Andy, Noise’s economic engine pulls double duty in enabling accesses. Similar to PrePaid Kate, this engine will run out of fuel eventually. However, where Kate deals with her limited fuel by running powerful run events to get the most out of her runs and a Levy AR Lab Access to recycle the fuel, Noise simply puts the corp on a short clock and threatens to mill them out. What all these engines have in common and what makes them so powerful is synergy, not only within the engine itself but with the runner and how they run. The Andysucker engine focuses on gaining resources through runs, so it uses cards like R&D Interface that benefit the most from being able to constantly run. Pre-Paid Kate used high value run events like The Maker’s Eye instead to use its strong bursts of credits to maximum value. Finally, Noise’s WyldShop engine didn’t use any run events or support (other than Medium), instead focusing on Noise’s ability to turn it’s econ actions into access actions as well.